This one Super X is one of the best ever. 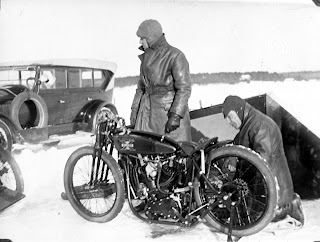 Raced on ice in Sweden during the late twenties. This particular pic is taken in 1930 at Sæterviken bay near Uppsala. There is just so much in this bike, study the details and imagine letting the engine stretch out on the ice surface at close to 100mph. "I cant prove it, but I`m quite sure this bike was owned by Ernst Bohlin, brother of another famous bicycle racer and motorcycle racer, Erik "Orsa" Bohlin. Erik set several records on ice and worked at Swedish motorcycle manufacturer "Nymans" as test pilot. Will have to dig into this, lets hope anyone Swedish recognise this bike and its history." Added 10.04.2011: OK, I have got an email from one very serious X brand enthusiast, Thomas Bund. Thomas is the author of a great book on the history of Scwinn`s Excelsior line of bikes, a book which is filled with interesting facts and pics on Excelsiors, Hendersons and the Super X. 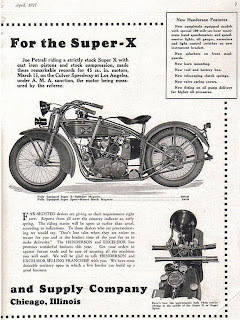 He informed me that the pictured Super X special once belong to Helmer Petterson from Sweden. Obviously Helmer and Erik "Orsa" Bohlin have known each other as both raced in the same time periode. Thanks a lot Thomas for letting us know. This story is to be continued, watch out. 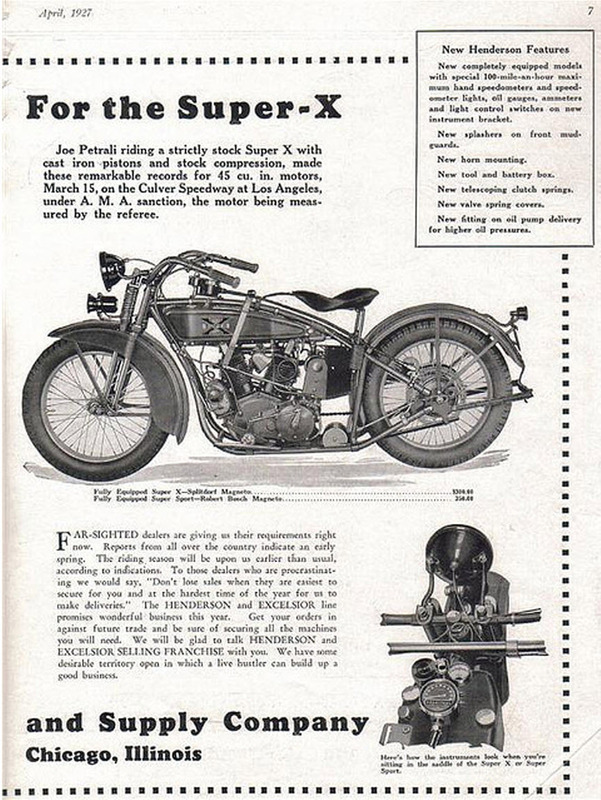 To better see all the modifications done to the ice racing Super X, compare to the original sales flyer from 1927. Harley forks, shortened rear frame, messinger racing saddle, steering friction dampner, racing bars and more. Hope you don´t mind me borrowing your incredible ice racing photo! I´m trying to collect as many X race photos as possible! And building one, as well.. This is where I used it.